There’s been an air of secrecy to Blade Runner 2049, the likes of which that had previously been reserved for Star Wars: The Force Awakens. This had been so extreme to the point where the earliest reviews of the film made such bold, sweeping statements as “even knowing the plot of the film is a spoiler”. This is a curious thing, as to be very blunt about it, Blade Runner – as a franchise – is really no Star Wars. And that’s not meant to be a pejorative, as I think Ridley Scott’s 1982 masterpiece is one of the greatest movies ever made and occupies a space that’s cohabited by films like 2001: A Space Odyssey, Metropolis, and Solaris as sci-fi perfection that transcend their genre and instead become pure art on their own terms. The ironic thing about the original Blade Runner in this same context is that its plot was really the least influencing factor for the filmmaking that followed in its wake. Certainly its questions about what defines humanity, and how those deemed as “other” are treated within the confines of the police state are as relevant as ever, but it’s never the first thing you think about when you imagine its version of Los Angeles in 2019. Instead you’re much more likely to picture the neon lit alleyways, or Deckard feasting on noodles while trying to stay dry in a city that never seems anything less than perpetually wet, or Pris’ black and white facepaint, or the flying cars, or the ads for Pan Am and Atari. The fingerprint that Blade Runner left on the cinematic landscape, and gave way to a whole genre of dystopian fare, is really a case of aesthetics. We all have a picture in our head of what Blade Runner is, but the actual task of watching it requires a little extra work. Just like 2001, you have to rewire your brain a bit, and prepare for a slower experience. You have to be ready for laborious shots of Deckard’s vehicle heading to the Tyrell Corporation or his tinkling on the piano while being foisted with visions of a galloping unicorn. I can’t blame anybody for finding it just far too insurmountable, and I’ve heard every reason in the book for why someone might not like the movie, but…and I can only speak from personal experience here…once it gets its hooks into you, it has you and never lets go. Blade Runner 2049 is exactly like that in every way, except turned up to the nth degree. What’s amazing about the film is that when initially announced, it was a stomach turning development. Visions of the same sort of ill-intentions that gave us dogs like Prometheus floated through my head. But thankfully, 2049 has a number of elements in its favor, first and foremost being the man behind the camera in Denis Villeneuve, who with each successive English-language feature has become a better filmmaker, especially coming off last year’s critical darling Arrival. Much like his predecessor Scott, he has a bit of tin ear where screenplays are concerned, but unlike present day Scott he has the innate ability to hone them into something workable, discarding shaggier elements at his leisure. Combine that with his oft-collaborative DP Roger Deakins, whose talent with a frame is unmatched in the industry (the man practically turned an otherwise ho-hum James Bond movie into a kaleidoscopic epic all on his lonesome), and tie it all together with one of the most compelling leading men working today and you’ve got all the ingredients in place for something very special. 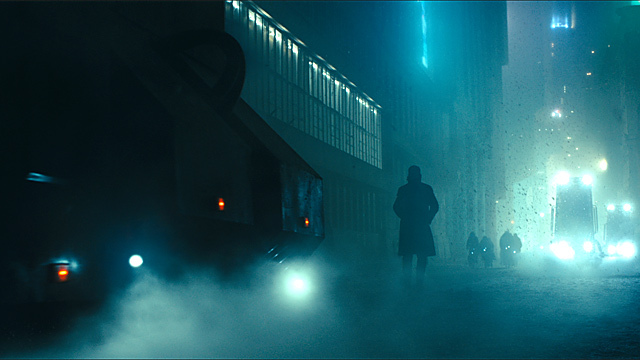 The subject matter approached by Villeneuve and team finds its thesis within the act of expanding the scope of Blade Runner’s world. While we still see the events of the film through the eyes of another Replicant hunter (Ryan Gosling’s K), the discovery of a mysterious object buried on the property of one of his targets leads him on a journey that makes Deckard’s jaunt through the bowels of Los Angeles look like a Sunday afternoon stroll, while placing him squarely in the sights of new Replicant impresario Niander Wallace (Jared Leto). While 2049 lovingly crafts the streets and glow-inflected urban pathways that populated every moment of its predecessor, though with the next evolution of a number of its elements (ads are now giant-sized holograms, the weather seems to have gotten even worse somehow, and it’s also just a tad more French), this is an adventure that also invites viewers to witness other landscapes such as Las Vegas and San Diego – broadening the horizons of that world and our questions as to what set off onto this very course of humanity’s downturn. Beyond that of the physical, the thematic content of 2049 is equally shifted further into the existential; as Replicants still ponder their sense of humanity, via K’s POV we spend most of our time pondering the nature of reality itself. This is dealt with both through his own emotional attachments and sense of memory, a not unfamiliar combination for this franchise, but there’s a little sprinkling of the tortured longing present in Spike Jonze’s Her in that stew as well, especially with perfect counterbalance from his romantic opposite in Joi (Ana de Armas in a star-making turn). From that additional wrinkle, we take a deep dive into the emotional grounding of this strongly Kafka-influenced protagonist. Gosling is, in that sense, the perfect star for the perfect time. A striking figure, even when not dressed to the nines in a very Roy Batty looking coat, Gosling’s detachment and even, at times, boredom, fits the outlook of this world like a glove. His swagger is equal that of Ford’s in his prime, but there’s an extra layer of preoccupation there that makes his performance one that’s incredibly difficult to take your eyes off of. Honestly, no one else in the film even comes close to this kind of gravitas, until Deckard himself returns. And well…that’s when things really get heavy. Where the sequel also expands on what came before is in its pacing and running time. This is a very long film at 2 hours and 45 minutes, and it absolutely takes its time to build a scene. The more distracted viewer may find themselves in a tough pickle here, as only intermittent, and sometimes jarring, action sequences are peppered in to kick up the adrenaline. Those going in for the visual splendor (and perhaps even the ennui) will be in for a much better time. To be very clear, Villeneuve and Deakins may very well have cooked up the most beautiful cinematic experience I’ve borne witness to. The sheer variation of space through forced perspective and shifting palette is one to behold and dizzying in its effect. From the familiar blue-hues, to a dingier humid grey, to a radioactively inhuman orange, every single shot is perfectly composed within an inch of its life. I doubt I’d be able to pause the proceedings and find a picture I’m not completely in love with. The slight twists and turns of the story are best left to be experienced and discovered, but needless to say, Blade Runner 2049 presents mythos altering developments and may very well leave those who fall under its spell with just as many questions as answers. It’s not a movie that’s interested in your need for closure, or big third act battles. This is as challenging a blockbuster as has been made in the modern era, and it’s all the better for it. I’m loathe to make the comparison to a film that is basically its exact opposite in nearly every way, but in terms of pure ethos this is the first truly great otherworldly epic we’ve gotten since Mad Max: Fury Road. And much like that sand dusted masterpiece, this is the rare sequel that uncovers truly new narrative real estate in what has come before by offering a deeper realization of its initial offering, and by that same token offers a way forward for the major studio tentpole machine. “I’ve seen things you people wouldn’t believe”, indeed.